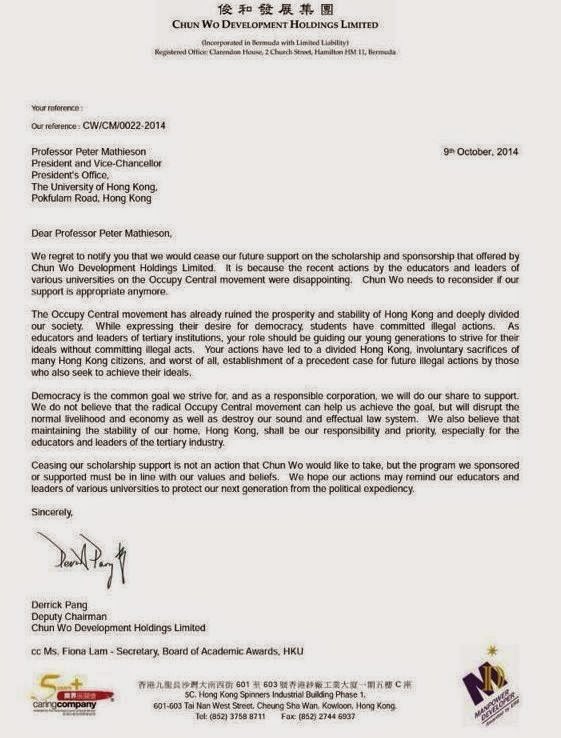 One of the more absurd details, among the thousands of small and large incidents swirling around the protests, was the attempt by Derrick Pang of Chung Wo Development to punish Hong Kong University by cancelling its HK$20,000 scholarship to the university. The head of the HKU student union is quoted as claiming "this is a form of political suppression on academic freedom and the school's autonomy." Well, not really. A donor can give money for any purpose it wants, though of course a university can reject the money if the strings are too onerous or political. But Derrick's letter is a classic example of elite petulance. Below is a copy (it is even amazing that he chose to release the letter). This case illustrates one of the more astonishing aspects of Hong Kong elite culture and philanthropy. The scholarships the rich give to universities are mostly of this tiny size: HK$20,000 is only US$2,564. The HKU scholarship is for two students, so each student is getting just US$1,282 per year. Tuition at HK's universities is HK$42,000 per year, so the scholarship is only covering a bit less than a quarter of a student's tuition. I'm always astonished to see the long list of these tiny scholarships awarded, each with a company or person's name prominently attached, as though it was bringing prestige. I would think these small scholarships would be considered embarrassingly small. I find the letter really captures the elite point of view. It accuses the university of leading to a divided Hong Kong, when of course the division comes from the government's failure to come up with a moderate election proposal that could marginalize the more radical protesters. The focus on "sound and effectual law system" ignores the frustration that decades of inaction on democracy and inequality have led to. I have no idea what the "political expediency" is that Mr. Pang refers to, but it is clear that in his hot-headed and grandstanding gesture aimed at "punishing" HKU, he has only hurt the students who would have otherwise gotten the scholarship, since none of the money went to the university anyway. Thus, we have another gesture (like a class boycott) that muddles its symbolism. But since it was not much money anyway, and not need-based, no big loss. This story was in the blog feed of the SCMP yesterday, Sunday, but today it has been removed. I found it at HongWrong.com. I can't imagine why the SCMP removed the story.